John Golden specializes in insurance defense, with a significant portion of his work dedicated to commercial liability and litigation. He also defends clients against products and professional liabilities claims and works to resolve issues arising from business disputes, motor carrier, and property claims. Prior to joining Fields Howell, John practiced defense litigation in state and federal courts pertaining to medical malpractice, general liability, commercial litigation, and real estate law. As a law student, John gained experience as a legal intern for the Association of Operations Management. He also interned at a major national law firm in Chicago, where he gained valuable experience in intellectual property, employment, and labor law. 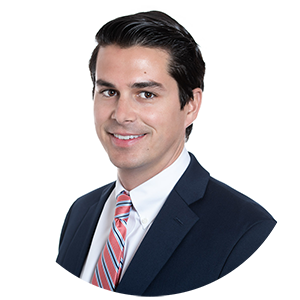 John graduated from the Chicago-Kent College of Law in 2014 where he was a leader in Civil Procedure. While in school, he received a CALI book award in Civil Procedure and went on to become a teaching assistant on the topic. He also served as the submissions editor for the Chicago-Kent Journal of Intellectual Property. Successfully defended and argued against plaintiff’s post-trial motion challenging the constitutionality of cap of non-economic damages provided in Fla. Stat. § 766.209 on behalf of a Florida hospital. Counseled technology startup on issues such as equity agreements, intellectual property, incorporation papers, and liability policies and procedures. Represented and defended physicians, nurses, and hospitals in medical malpractice cases. Successfully prepared and prosecuted trademark application at the United States Patent and Trademark Office on behalf of technology startup. Assisted in defense of corporate clients in various labor and employment matters including matters before the Equal Employment Opportunity Commission.